Hortense Dixon. Courtesy of Texas Tech University. Image available on the Internet and included in accordance with Title 17 U.S.C. Section 107. Texas Southern University Letterhead. Courtesy of Texas Southern University. Image available on the Internet and included in accordance with Title 17 U.S.C. Section 107. Mayor Fred Hofheinz. Image available on the Internet and included in accordance with Title 17 U.S.C. Section 107. Hortense Dixon's Book. Courtesy of the Institute of Education Sciences. Image available on the Internet and included in accordance with Title 17 U.S.C. Section 107. DIXON, HORTENSE SELENA WILLIAMS (1926–1988). Hortense Selena Williams Dixon, educator, writer, and civic leader, was born in Houston, Texas, on January 29, 1926, to John H. and Barbara (Roquemore) Williams. Dixon’s father was an agent of the Texas Agricultural Extension Service, and she spent most of her childhood in the rural communities of Cameron and Hempstead, Texas. Dixon went on to pursue higher education at Prairie View University (now Prairie View A&M University) from which she received her bachelor’s degree in 1946. She earned a master’s degree from the University of Colorado in 1954 and in 1970 was the first African American to earn a doctorate degree from Texas Tech University. She extended her graduate educational experiences at New York University, the University of Minnesota, and Cornell University. She married Thomas Edison Dixon, Jr., and the couple had one son, Thomas Edison Dixon III, in 1956. In her long tenure as an educator, Dixon held a variety of academic and administrative posts in the Austin (Texas) public schools, as well as at Bishop College (formerly located in Marshall, Texas), Michigan State University, South Carolina State University, and Texas Southern University where she spent the greater part of her career. 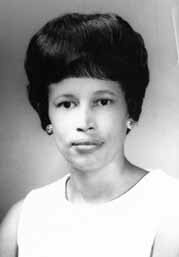 Her first appointment at Texas Southern University was as an instructor of home economics in 1951; however, her talent, intellectual tenacity, and curiosity caught the attention of others in the faculty and administrative ranks and she was soon assigned to other progressive positions at the university, including facilities planning director, assistant to the dean of faculties, and director of the Urban Resources Center. Dixon was the first woman in the history of Texas Southern University to become a vice-president when she was named vice-president for Urban Programming in 1974. In 1975 Dixon took a leave of absence from Texas Southern University to become executive assistant to Houston Mayor Fred Hofheinz. She was the first African American to hold that position and had responsibility for six departments including health, public service, and community development. Upon her return to Texas Southern University, Dixon was appointed vice president for University Relations, a position she held until she was appointed director of the office of community development for the Tennessee Valley Authority (TVA) in 1980. At that time, she was both the highest ranking minority and the highest ranking female executive in the TVA. However, she resigned within a year due to a dispute over reduced expenditures on the agency’s social programs. A prolific writer, accomplished lecturer, motivational speaker, and community advocate, Dixon received numerous awards, honors, grants, and board appointments which included memberships to the board of Riverside General Hospital and the advisory committee to the Texas College and University System Coordinating Board (see TEXAS HIGHER EDUCATION COORDINATING BOARD). She was a founding member of National Women of Achievement, Inc., and served on the advisory panel of the National Endowment for the Arts. As an author, her writings primarily focused on the role of the university in community development and improving the educational and professional opportunities for minorities and youth. She also coauthored a book, Texas Southern University: From Segregation to Special Designation, published in 1975. Hortense Dixon died on April 19, 1988, and is buried in the Houston National Cemetery. Hortense Dixon File, Heartman Collection, Robert J. Terry Library, Texas Southern University. Houston Chronicle, February 19, 1975; April 17, 1977. Handbook of Texas Online, Shirley R. Nealy, "DIXON, HORTENSE SELENA WILLIAMS ," accessed April 19, 2019, http://www.tshaonline.org/handbook/online/articles/fdi55. Uploaded on July 31, 2013. Modified on February 1, 2017. Published by the Texas State Historical Association.